Ellen Wurtzel is an associate professor of history at Oberlin College (Ohio). She also took part in the recent issue of the Royal Studies Journal on Taking Possession. RSJ Blog: Thank you for doing this interview on your recent article in the Royal Studies Journal “The Joyous Entry of Albert and Isabella in Lille”. First of all, could you tell us a bit more about what a “joyous” entry is, especially in comparison to other forms of entry or taking possession? Ellen: Thanks so much for the opportunity of talking more about the article; I really enjoyed being part of the special issue for RSJ on Taking Possession. Joyous Entries were a particular form of late medieval ritual, but as you note, not the only one. Cities had numerous kinds of festival moments, including triumphal entries, marriage celebrations, peace processions and annual religious events. What differentiated Joyous Entries from these other celebrations was that they were the first visit of a ruler to a city, often at the beginning of his or her reign. It was a moment of introduction that served as an important kind of communication between two political entities. While it is unclear exactly when this political ritual began, the inclusion of a written agreement originated when the Duke of Brabant entered the city of Leuven and delivered a charter in 1356. One article stated that if the sovereign did not fulfill his duties as specified in the document, his subjects would not be bound to obey him further. When tensions rose in the 1560s over religious and political differences in the Low Countries, the Brabantine document was reprinted and distributed in a number of cities in order to legitimize a burgeoning rebellion. The 1582 Entry for the Duke of Anjou in Antwerp, in the midst of rebellion, contained pointed references to Spanish tyranny. Joyous Entries, like any liminal moment, could be fraught with potential disruption. Interestingly, this ritual was revived with the founding of Belgium in 1830. The most recent Joyous Entries occurred in 2013 for King Philippe and Queen Mathilde and included the cities of Bruges, Antwerp, Ghent and of course, Leuven. RSJ Blog: In your article, you highlight that urban history considers early modern cities, and in particular, rituals like joyous entries as losing importance compared with the rising power of territorial rulers, in the case of Lille, the Habsburgs. Could you expand a bit on this? How can the relation between city and territorial rule be classified? And, is there really a decline in urban independence compared to the (late) middle ages? Ellen: These are really big questions that depend in large part on what area of Europe one studies and how one defines the territorial power of rulers like the Habsburgs in the early modern period. The traditional narrative, shaped by Henri Pirenne and other social and economic historians, focused on the development of the powerful cities in Flanders and Brabant since the southern Low Countries was one of the most densely-urbanized populations in the later Middle Ages. Medieval cities, created to enable long-distance and local trade, arose and eventually weakened the power of feudal lords. A new class of people no longer bound to the land/service to their lord created economic opportunities and begat political liberties—and power. At the end of the Middle Ages, Pirenne argued, monarchical states developed political organizations that were strengthened by bureaucracy drawn from city elites, loyal armies, and the power to implement new taxation. With cities drawn more and more into the orbit of rulers’ needs—for money and war—their independence lessened. Therefore, in this traditional model, rituals like Joyous Entries could no longer be seen as a kind of negotiation, a contract, but rather a symbolic acceptance of territorial rulers’ overweening power. While the dominance of that older model has been considerably weakened by the work of many historians in the past 25-30 years, it continued to shape the way that Joyous Entries were perceived until quite recently. Cities and states are no longer seen as either diametrically opposed systems or diachronic in importance. Even for strong-state kingdoms like France, historians have shown that the ‘state’ in its modern form was not fully-defined in the early modern period and different polities, including cities, continued to exercise corporate power vis-à-vis other political institutions. Moreover, not every city had an antagonistic relationship to the territorial ruler—Lille is a prime example of a city that promoted accommodation and peaceful negotiation while still retaining many liberties. In the early modern period, its officers consolidated power vis-à-vis other local authorities with whom the city corporation competed. The recognition of this diversity in the early modern period has enabled scholars like Anne-Laure Van Bruaene, Margit Thøfner, Michael Wintroub and Michael Breen to examine events like Joyous Entries in a new light, both in terms of audience and message. My research on Lille’s Joyous Entry of 1600 in the RSJ confirms the continuing importance of these events as a primary site of identity fashioning and political negotiation, and allows us to ask new questions—about how city residents perceived their own pasts and how that perception of history and identity shaped their interactions with rulers. 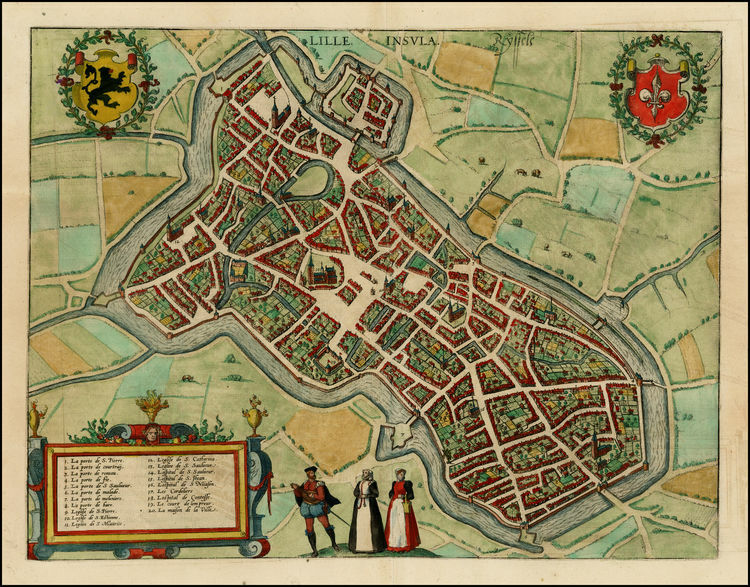 RSJ Blog: Lille at the turn of the sixteenth to the seventeenth century was, although firmly under the rule of the Spanish Habsburgs, geographically and culturally close to the rebellious cities of the later Netherlands/General States. In what ways was this visible also in the recognition of a new sovereign in 1600? Ellen: It’s important to remember that in 1600, the Dutch Revolt was far from over. War between the Habsburgs and the French had ended in 1598, but the seventeen provinces of the Low Countries were still at war and would be officially until 1648. Although delegates from Walloon Flanders (Lille, Douai and Orchies) and Hainaut had signed the Treaty of Arras in 1579 and Alexander Farnese had won back allegiance to the Spanish Habsburgs in other southern provinces, it was in no way clear that the Low Countries were to be divided permanently into two separate political entities. Since the thirteenth century, Lille’s merchants and political elites had longstanding commercial ties with other cities in the Low Countries. They shared many cultural exchanges through participation in competitions of rhetorical societies and sent ambassadors to other cities. By the sixteenth century, their delegates met with those from other regions in the States-General and negotiated for lower taxes. The introduction of the Protestant Reformation, increasing taxes, and subsequent political tensions with the Habsburgs, however, meant that common ground was difficult to find, particularly since some city governments embraced the new religion and others did not. That uncertainty about the collective identity of the Low Countries remained in 1600, alongside hope for stability and peace under new sovereigns Albert and Isabella. While the lavish spending on the event, and ritual of the Joyous Entry itself mirrored what was seen in nearby cities like Valenciennes and Antwerp, Lille’s Entry focused primarily on the city’s history in relation to its rulers and (perhaps purposefully) avoided references to specific neighboring cities. RSJ Blog: Part of the festivities were tableaux vivants, living pictures, which represented the city’s history by highlighting important events. It was, in a way, a form of historiography “written” by the magistrates of the city – what can these living pictures tell us about sixteenth-century Lille, and how they saw themselves? How were they different from earlier representations or from other cities? Ellen: Many cities in the Low Countries, France and England included living pictures in their festivities throughout the later Middle Ages. They were a wonderful way of making history come alive by forging a relationship between past events and the present viewers. Local people that one knew would dress up as the long dead Queen Mahaut or King Philip II surrounded by the conquered but happy people of his empire. It allowed people in cities like Lille to forge a personal relationship to far off or far distant events and implicitly acknowledge their legitimacy and relevance. Tableaux vivants were didactic forms of entertainment, but they also meant to display the learnedness of the local elite—sometimes with mixed results. In one memorable visit of Duke Charles the Bold to Lille in 1468, one of his counselors, a Lille native, thought he would honor the city by having three local women perform the Judgment of Paris. They were, according to a now-lost chronicle, apparently so far from Hera, Aphrodite and Athena in size and stature (one was nicknamed Grosse Juliette, another so thin that the author likened her to a herring) that upon seeing the scene the duke burst out laughing and was unable to stop! These classical or religious histories were popular subjects well into the sixteenth century, but during the fraught years of the 1570s and 1580s, their high-flown symbolism became weighted with barely-concealed allusions to Spanish tyranny. Lille’s Joyous Entry of 1600 pointedly avoided protest. The program focused less on religion or allegory than local events, shifting to what I would term a more prosaic kind of history. It indicated the increasing popularity of new forms of historical writing and the presence of humanist-educated men like Floris van der Haer, who published histories as well as fashioned the Joyous Entry. But it also meant that lillois magistrates wanted to introduce themselves to their new sovereigns by fashioning a different kind of narrative including their rulers’ imperial conquest, their own steadfast loyalty and a shared faith, Catholicism. RSJ Blog: You argue in your article that some of these tableaux vivants were already imagining Lille as part of the nation of Belgium, a territory which came into being as nation-state in 1830, more than 200 years later. How far were early proto-national sentiments already influential in the early modern period in Lille? And what did the contemporaries understand as “Belgian”? Ellen: Although the focus of the Joyous Entry was Lille’s history, a number of the tableaux vivants and triumphal arches included references to the Belgian people and Belgium. These terms began to appear in reference to the whole Low Countries beginning in the 1550s, particularly in scholarly circles, and which both writers in the north and the south were using to describe their “Netherlandishness”. Some historians have argued that the shift from the plural les pays de pardeça to the singular, le pays de pardeça, or use of Nederlands or la Belge indicate a nascent nationalism. The Treaty of Augsburg in 1548 had made the Low Countries its own entity within the Holy Roman Empire (The Burgundian Circle) and the Pragmatic Sanction the following year ensured that the same ruler would inherit the seventeen provinces. During the Revolt, those references moved from the antiquarian to the political, when both sides made reference to the Low Countries in terms of fighting for their country, the patrie or vaterland. I think the frequent appearance of Belgian and Belgium in Lille’s Joyous Entry raises some interesting questions—did the organizers mean to be subtly political? Or did van der Haer, Lille’s celebrated organizer of the event, see Belgium as a concept highlighting the learnedness of Lille’s educated citizenry and nothing more? One can’t say for sure, of course, but the context of their use appears to indicate that the lillois organizers wanted to see themselves as part of a larger polity within the Empire of the Habsburgs and were trying to figure out a way to do it. Many were uncertain what that belonging meant in 1600, with ten provinces in the south under Habsburg rule and the seven in the north still rebellious. Belgium united them, within the city and regionally, without forcing them to define what exactly that meant. And while these references were entirely positive in the Joyous Entry, they may also have served as a subtle warning that Lille was not alone and could act with other provinces, as they had in the recent past. RSJ Blog: The historiography in the sixteenth century experienced its own “spatial turn”, long before the more recent one in the last few years: chorography and cosmography found its way into early modern history writing. Could you expand a bit more on these ideas and their implementation? Ellen: Yes, this idea of a sixteenth-century spatial turn was a really fun area to ‘think with’. While all kinds of historical writing was more common in the sixteenth century, the newfound interest among Europeans for places around the globe meant that chorography, or local description, became a popular way of pairing history with place. One of the most successful chorographies was Lodovico Guicciardini’s Description of All the Low Countries, which combined short descriptions of a number of cities and regions with maps and city views and includes their physical features, major monuments, events in history and celebrated figures. The focus of both the images and the written descriptions were on place, like a guidebook. Guicciardini and others described what happened in the past primarily through showing what could be seen—buildings, streets, oceans and fields. This emphasis on place created a particular kind of historical narrative. The peacefulness of chorographic descriptions contrasted with other kinds of history emerging during the period, like broadsheets that were published showing terrible events like the St. Bartholomew’s Day Massacre. When reading chronicle accounts of Lille’s Joyous Entry, I noticed that several of the tableaux vivants were very similar to Guicciardini’s Description in both language and subject, and it made me think about how much Lille’s Joyous Entry reflected a chorographic sense of history. The sovereigns moved through the streets of the city and touched on the events of the past through seeing the institutions their ancestors had created. The place-based fashion it told local history allowed lillois and their visitors to avoid reminders of the recent turmoil that had torn apart the Low Countries. RSJ Blog: Finally, could you tell us a bit about what you are working on now? What can we look forward to reading from you next? Ellen: Something completely different! I am finishing up one project but embarking on a study of urban bathhouses in the francophone world during the late medieval and early modern periods. From the mid fourteenth to the mid sixteenth centuries in the major cities of France and the Empire—Paris, Marseille, Avignon, Nîmes, Lyon, Besançon, Geneva, Tournai, Valenciennes, and Lille, to name a few—bathhouses welcomed all kinds, from locals and travelers to married couples, singletons, magistrates and members of religious orders. Histories of water and hygiene have noted the ubiquity of these places in urban France, and important studies have described the role of bathhouses in the history of prostitution, but little has been written on their social and economic history—who owned them, in what parts of cities, and with what labor and resources. It is a rich topic that can serve as a framework for understanding urban sites of sociability and gender distinction, medieval entertainment and pleasure, health and hygiene, material culture and the economy of individuals, families and institutions. RSJ Blog: This does sound interesting! We are looking forward to see what you discover in these urban bathhouses, and what it will tell us about late medieval/early modern urban culture. Thank you for doing this interview! This entry was posted in Journal Interviews, Royal Studies Journal. Bookmark the permalink.